Yay, I'm in another Etsy treasury! As always, I'm so pleased to have one of my bags amongst such prettiness. Thanks again, bellarosebyliz! "Mauve was first named in 1856. Chemist William Henry Perkin, then eighteen, was attempting to create artificial quinine. An unexpected residue caught his eye, which turned out to be the first aniline dye—specifically, mauveine, sometimes called aniline purple. Perkin was so successful in recommending his discovery to the dyestuffs industry that his biography by Simon Garfield is titled Mauve." Now you have a little nugget of knowledge to use next time you play "Trivial Pursuit"! Very interesting! Congrats on the treasury too! That's a gorgeous treasury list. Your purses would make any treasury look elegant! 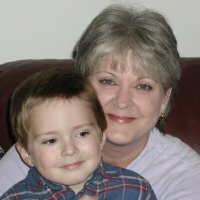 I'm going to try to make a list of my own for the first time soon. 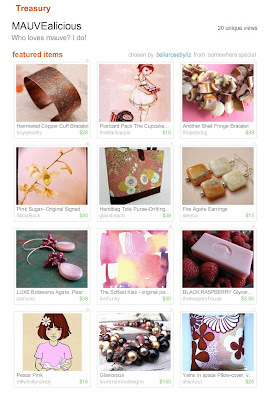 Ooh, Jenn, I'd love to see what catches your eye for a Treasury! So pretty! I love that bag. Beautiful list! You look fabulous in it! !